Ice cream on a stick is a category of ice cream novelties. 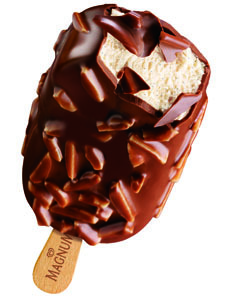 Above, a vanilla ice cream bar covered with chocolate and almonds from Magnum Ice Cream Bars, our favorite gourmet brand. This is Page 7 of an eight-page article on the history of ice cream. Click on the black links below to visit other pages. For those not familiar with the term, an ice cream novelty is a hand-held form of ice cream: an ice cream bar, a prepackaged cone or cup, a sandwich or any type of ice cream or ice on a stick. 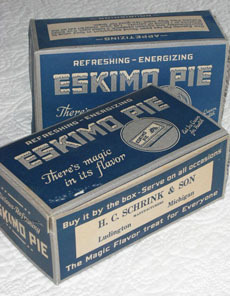 Eskimo Pies. In 1920, ice cream novelties arrived on the scene. The first was invented by a high school Latin teacher from Onawa, Iowa, Christian Kent Nelson. Nelson also had a small confectionery store, and was inspired when a boy started to buy an ice cream but switched to a chocolate bar. Nelson inquired as to why he did not buy both, and the boy explained that he could only afford one. Nelson began to work in his home laboratory, and couldn’t get the chocolate to adhere to the ice cream until his friend Russell Stover advised him to add some cooking oil to the coating. The first 500 I-Scream Bars were a hit at the local village fireman’s picnic. The following year, in a production agreement with Russell Stover, the renamed Eskimo Pie® was introduced. A vintage Eskimo Pie box, found for sale on Etsy.com. By 1922, Americans were consuming one million bars a year and there were a legion of imitators including the Klondike Bar. Harry Burt, a Youngstown, Ohio, confectioner who sold a Good Humor lollipop, made a version of the chocolate-coated ice cream bar on a lollipop stick, which made it neater for his children to eat. He sold Good Humor ice cream door-to-door in a truck outfitted with bells from the family sled. Dixie Cups. In 1923, another iconic product debuted. The Individual Drinking Cup Company, whose founder, Laurence Luellen, had begun creating foldable disposable paper drinking cups for water coolers back in 1908, had found increasing success with its disposable paper Health Kup following the influenza epidemic of 1918. In 1919, to differentiate it from competitors, the product was renamed Dixie Cup after a line of dolls made by Alfred Schindler’s Dixie Doll Company in New York City. Growth required relocation, and in 1923 the company moved from New York City to Easton, Pennsylvania. There, the idea developed to merchandise an individual, portable serving of ice cream in a Dixie Cup. The first experiments were a disaster, but the company soon developed a smaller, more rigid 2-1/2-ounce cup that would not absorb moisture or crumble in the filling process, that would sell for five cents. The cup had a patented, pull-off lid, and the ice cream was eaten with a spade-like wooden spoon. Ice Cream Dixies earned almost instantaneous consumer acceptance. The Company established a franchise plan, permitting only manufacturers of the highest quality ice cream to use their brand name on the Diamond Design Dixie cup. A Dixie-trademarked lid carried the individual ice cream manufacturer’s identification. Above, an original Dixie Cup lid, “co-branded” with the name of the local ice cream manufacturer. For 24 years, the underside of the lid featured collectible photos. These photos courtesy of Dr. Bruce Tharp, whose family made ice cream and who now teaches others to do the same. You can take his three-day course, On Ice Cream. 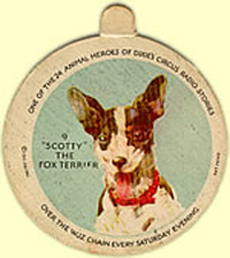 The Dixie Circus, a highly successful radio show, aired every Friday night on NBC (and later reappeared on CBS) to make the Ice Cream Dixie a household name, along with extensive magazine and newspaper advertising. From 1930 to 1954, a premium program featured collectible lids—an annual series of photos on underside, beginning with Dixie Circus characters and moving on to movie stars, sports personalities, a "nature series” of animals, exclusives produced for special clients, e.g. the U.S. Presidents lids for the Philadelphia Dairy Products Company, and, in support of the war effort in the 1940s, scenes depicting United States and United Nations forces in action. The picture was protected from the moisture of the ice cream by a thin sheet of paper. Two examples are shown below, and you can see examples here. 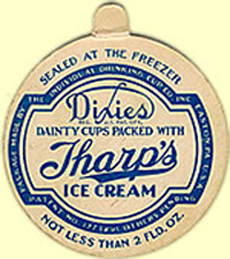 Dr. Bruce Tharp, whose family produced Tharp’s Ice Cream in Shamokin, Pennsylvania, and was one of the early companies involved with Dixie Cup packaging, recalls that various combinations of the initial series of circus lids could be redeemed for six premiums that assembled into a “circus” that was punched out from a heavy colored cardboard sheet and assembled into a big top, side tents and performers. Dixie supported the program by featuring it on a network radio program. Its objective, of course, was to encourage ice cream manufacturers to use the Dixie cup packaging for their products, thus benefiting from the strong marketing of the concept by the company. 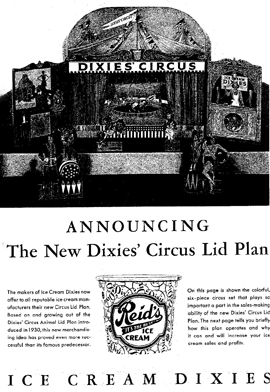 A 1931 ad from The Ice Cream Trade Journal announcing the “Circus Lid Plan.’” Photo courtesy of Dr. Bruce Tharp. 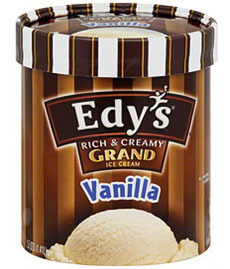 Edy’s Grand created one of the first “combination” flavors, Rocky Road. Photo courtesy Edy’s. By the 1930s, Howard Johnson’s restaurants claimed 29 flavors; then brothers-in-law Burt Baskin and Irvin Robbins came up with the idea of 31 flavors—one for every day of the month. Whether from a street vendor, the ice cream parlor, or a package picked up at the corner drug store (these were the days before grocery stores had frozen food cases), all of America now had access to ice cream.